I set a challenge to myself to see how many outfits I can put together with a striped t-shirt. Since I work from home as well as being a mom, my daily ensemble has to be comfortable and relaxed. Owning a few basic capsule separates make it easy to mix and match, thereby, creating many looks without having to spend a fortune. With the temperature hitting below 0˚C, I'm trying to cheer myself up by looking at a summery outfit. 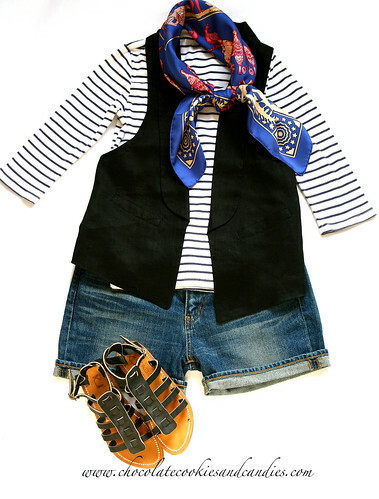 Gap striped t-shirt, Uniqlo shorts and waistcoat, K Jacques gladiator sandals and Hermes Early America scarf. I decided that a summer dress would be perfect for layering in lieu of a sweater. Gap striped t-shirt, Zara dress and heels. Spring is definitely on my mind lately so here's another look for the warmer months. Gap striped t-shirt, Burberry quilted jacket, Louis Vuitton leopard stole, Uniqlo chino pants and Chanel ballet flats. With a quick change of jacket, shoes and necklace, you'll get a different but more appropriate outfit for work. Gap striped t-shirt, Uniqlo chino pants, black lace necklace (no brand costume jewelry), Banana Republic jacket and Manolo Blahnik slingbacks. Switch the chino pants with a pair of dark straight skinny jeans and pair it with a tweed Chanel jacket, you're ready for an evening night out or a semi casual party. Gap striped t-shirt, Uniqlo jeans, Nichii faux pearl necklace and Chanel ballet flats. LOVE all the combos! I've been looking for a Breton striped shirt and that Gap one is nice. Is it from this season and does it have a tight fit? I saw a really cool striped shirt from Comme des Garcons at Liberty's last December (50% off too) and regret not buying it. That Zara dress is also fab. Thanks, DA! That was from their previous S/S collection. I notice that the gap between the stripes are getting larger and larger each collection. These tees has a scoop neckline and 3/4 sleeves. I buy them a size larger as I prefer a looser fit. The Zara dress was a £10 find :P Hides A LOT when I was having a non stop eating fest in NZ and Asia. Thanks! I also prefer my tees loose, they feel much more comfortable and I also think they look better (more proportioned to one's self kwim) while worn. Yes, I totally agree. I always buy one size up with tees. More flattering too. I've been looking for a nice b/w striped tee too but the one I bought from Gap the other day is navy/white. Most have a boat neckline which doesn't work too well with me. BTW DA, you can find striped t-shirts by Petit Bateau at http://www.monshowroom.com/en/petit-bateau. They're on sale at the moment. Ahhh. I see where moimoimoi.co.uk gets their stock. I've just placed an order for 2 more striped tees from PB but I'm going to bookmark this website so I'll know where to go to stock up. You're always so encouraging, q9y8! As for the photos, nope (! ), yours win hands down. Love the lovely editorial shots of yours. You just pushed me to the edge and I just bought a Breton shirt LOL! Inspired by your post, I also created a new blog entry on Breton shirts (and espadrilles)! LOL! Good on you, DA.